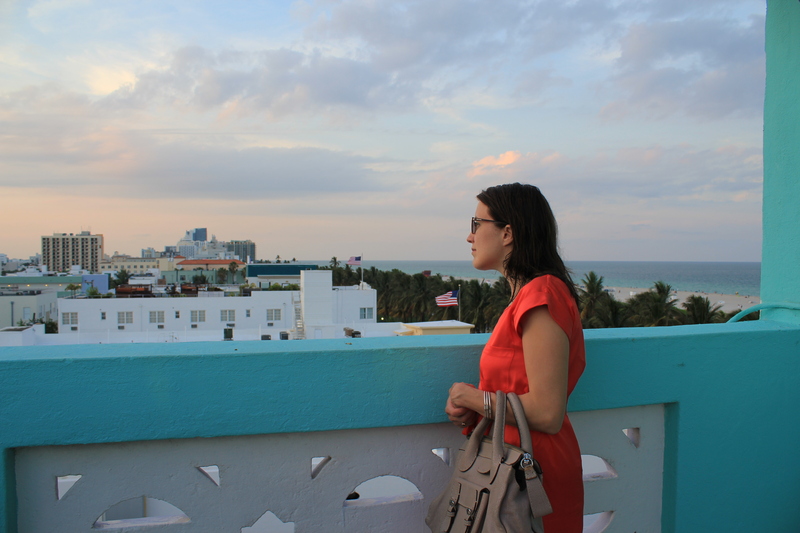 I think the problem of travelling is easily explained: the more you travel, the more you want. And the more you experience, the more you realize that the list of places to visit is endless. 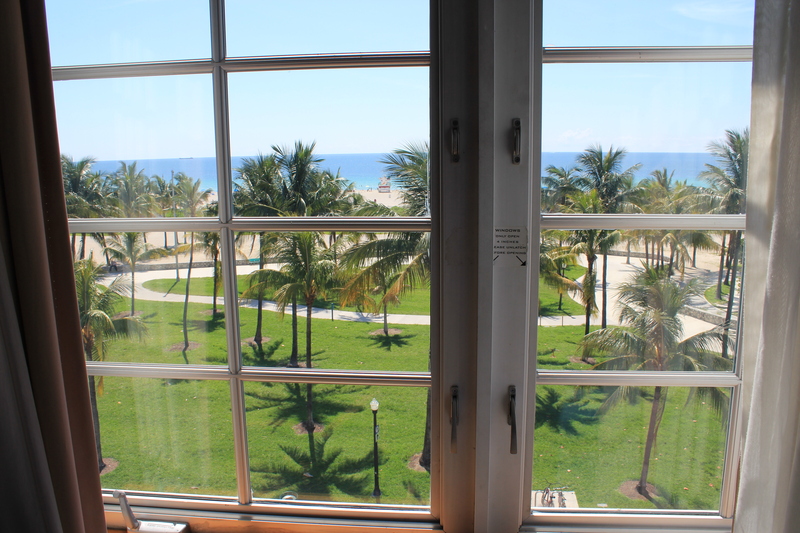 Furthermore, you want to experience new destinations, but eventually you also want to return to places you already know because your experience piles up and you want to see how you would now feel about an X place. See what I mean? Today I was on a more cheerful mood so I started missing Southern France. Avignon where the Popes lived for a short period, gypsy town Saintes-Maries de la Mer, world-famous Saint Tropez and charming Menton. I have done these places several times and what a road trip that is! It is likely that I will travel next week, so in overall, I am not doing so badly. But I would not say no to hopping on a TGV train tomorrow for a weekend trip either! What about you? Toward the end of each trip, do you start to have that itching feeling of rushing home, or do you secretly (or openly) wish you could continue forever? This entry was posted in Uncategorized and tagged art, Catholicism, Cote d'Azur, fashion, France, India, North India, Paris, religion on June 26, 2014 by Miia. 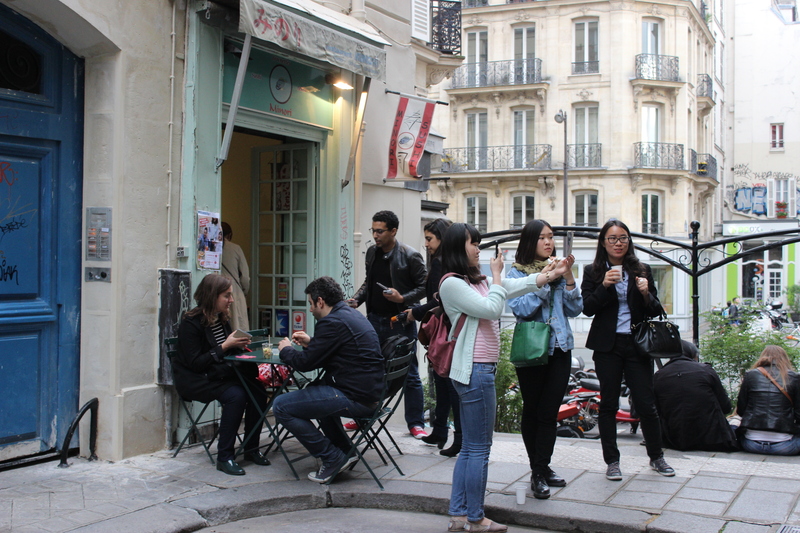 For the third consecutive year, the City of Paris organized Les Heures Heureuses in the end of May. 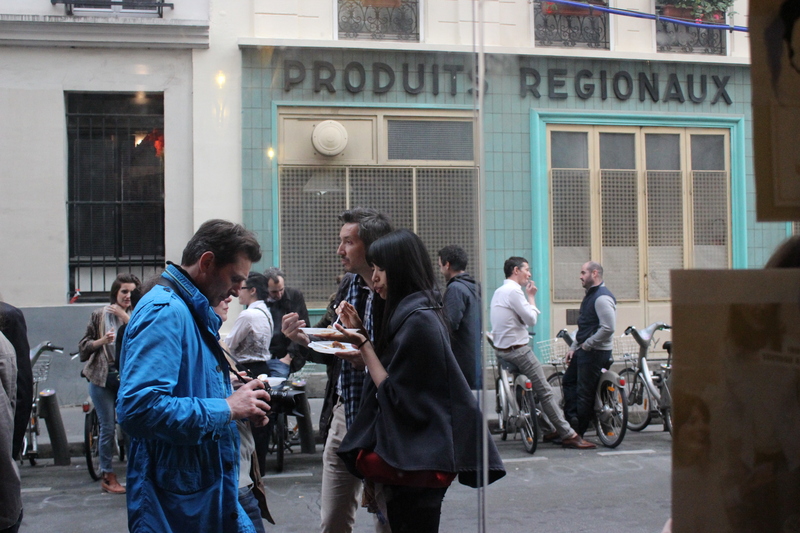 This successful food event has become very popular and it is about new discoveries: to make Parisians break their usual habits by visiting new bars and restaurants. And sure, there is a lot to discover! 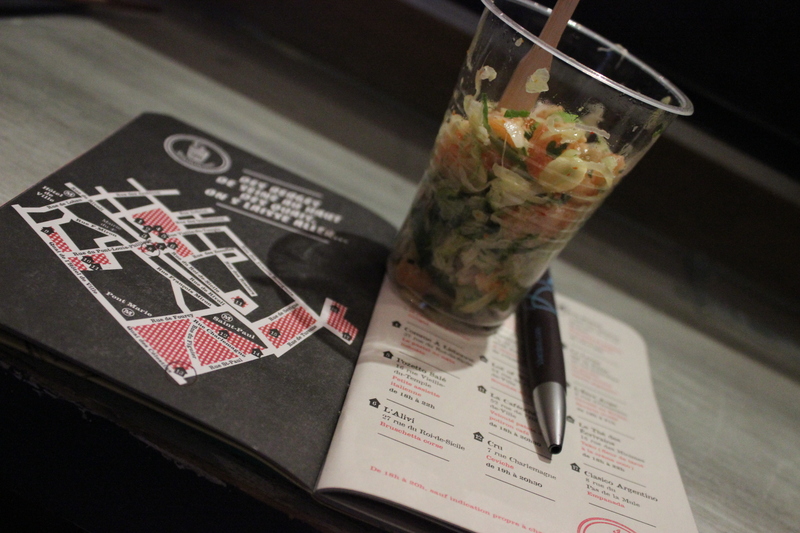 This year, more than 280 restaurants in different parts of Paris were selling small tapas at only 2€ and most places offered wine at 2€ per glass to go with. We participated only on Friday night (and missed Thursday and Saturday), and made some excellent new discoveries. Tip: If you have not yet eaten at Mavrommatis (42 rue Daubenton), hurry up! One of the best pigeons I have ever eaten. 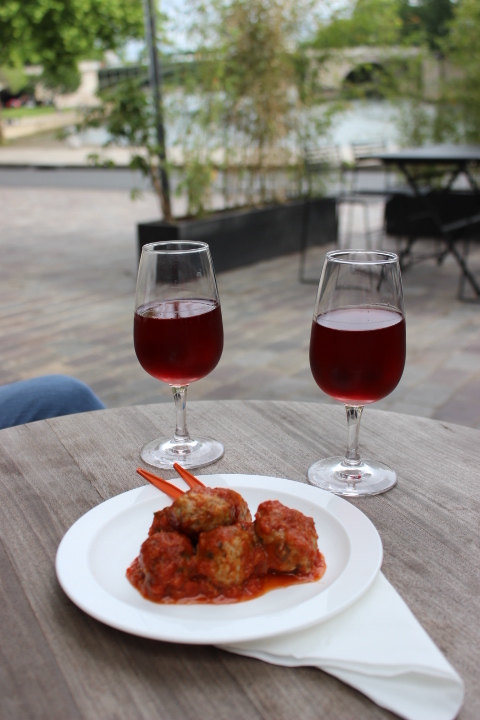 Our second stop, Les Nautes, continued on the Mediterranean side: veal meatballs in tomato sauce. Yummy! And excellent rosé. Tip: Looking for a terrace by the Seine this summer? Think of Les Nautes: newcomer by the Seine. During Paris Plages there won’t be any cars. From the Seine we moved to the heart of Marais for marinated salmon with herbs and edamame. Allo Sushi was previously unknown to us and we made a decision to make it our new Japanese cantine. Tip: Every morning a seven-kilo Scottish salmon is delivered to Allo Sushi… with Le Label Rouge guarantee of excellency! 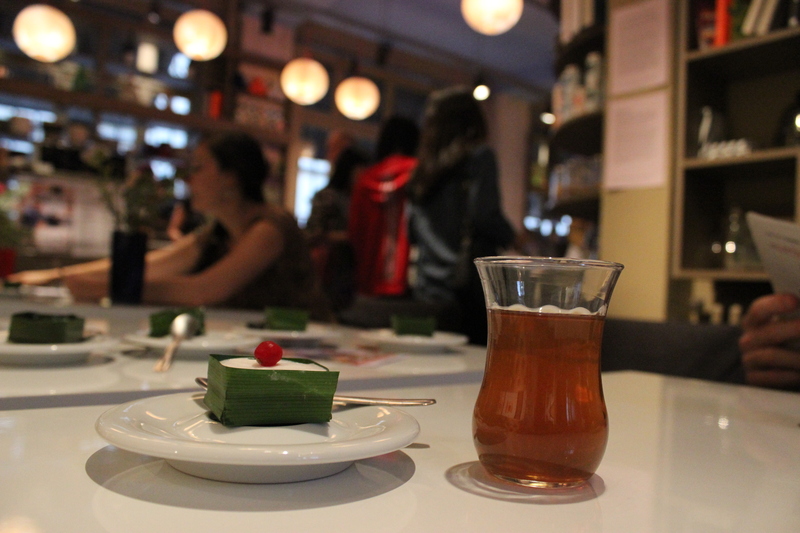 Our fourth stop was a book shop with a cafe –again a place we did not know about. Le Thé des Écrivains served a delicious Thai cake made of tako flower and coconut milk, and we had a cup of tea with it. A delightful address worth returning to! Tip: More than a book shop! Cultural activities every week. Check Le Thé des Ecrivains for program. Energy level up, we walked from the Marais to the 11th arrondissement. Our fifth stop was L’Embuscade, a lively bar in the trendy Oberkampf area. We had homemade Berber couscous and enjoyed friendly service and lively atmosphere. Tip: Free couscous every Friday!! Next and last stop was in Oberkampf, too. 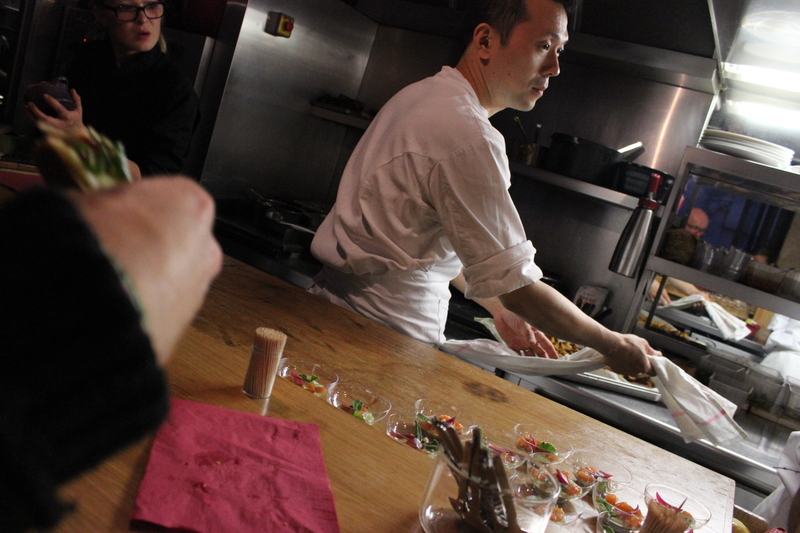 Run by a Top-Chef finalist of the same name, Pierre-Sang has been making buzz in Paris since 2012. We had two cheese tartines that were served with some unidentifiable (but delicious!) sauce. Will return very soon. Tip: No reservations, no telephone, so arrive at the opening (7 o’clock in the evening) and preferably a bit earlier! It was my first time to take part in Les Heures Heureuses and I would not want to miss it next year! We made many new discoveries at the cost of 40€ for two wine included. Who would not be happy? This entry was posted in Uncategorized and tagged bistrot, cafe, fashion, food, France, Greece, Japan, Paris, restaurant, wine, wine bar on June 12, 2014 by Miia. 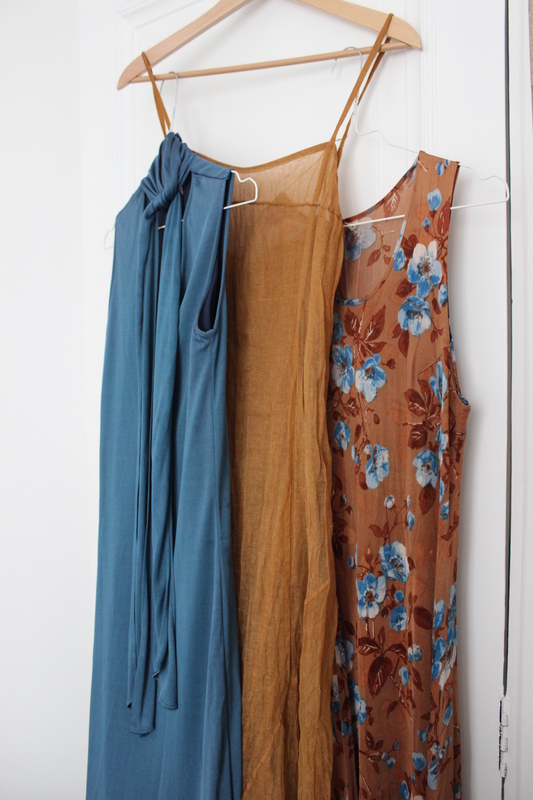 Cleaning and arranging are not my most favorite past-time activities but I have to admit they bring benefits… like rediscovering things that you forgot existed and coming up with new decoration ideas with these newly-found objects! We bought these four marble skulls in Varanasi, from the same man who sold us the Nandi (Home Sweet Home). 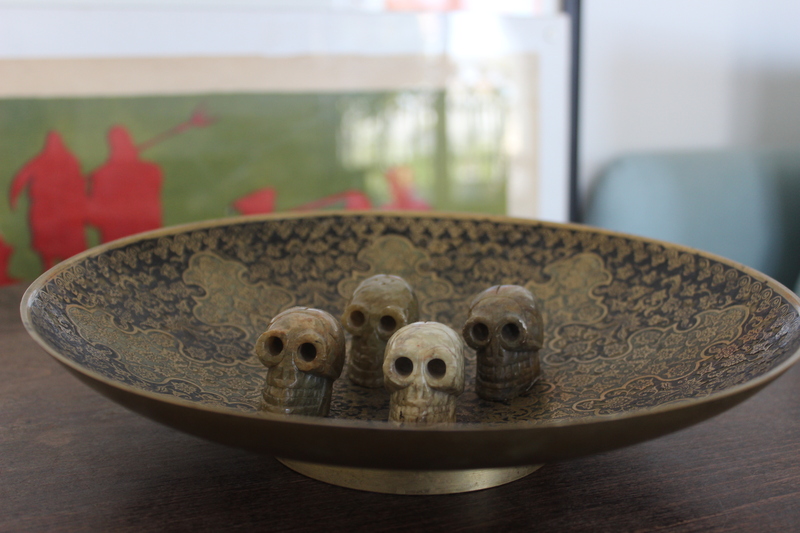 Yesterday while cleaning I placed the skulls on this bowl (that I think comes from Zanzibar) because they were on my way, but once I took a second look I realized they actually look quite stylish. Especially with those red communist farmers in the background (an old Communist propaganda poster from Kyrgyzstan). Skulls are very fashionable these days. My husband is dreaming of a tiny golden skull necklace. Skulls have a lot of symbolic values and not only among different religious groups. A skull is actually beautiful –even that black, burnt skull I saw at the burning ghat in Varanasi. Skulls fascinate and scare us. What do you think? Would you have them at home as a decoration item? What do they symbolize to you? This entry was posted in Uncategorized and tagged art, design & decoration, fashion, France, Hinduism, India, Kyrgyzstan, North India, Paris, religion on June 8, 2014 by Miia. During my last visit to Helsinki I did something that I recommend every tourist to do. 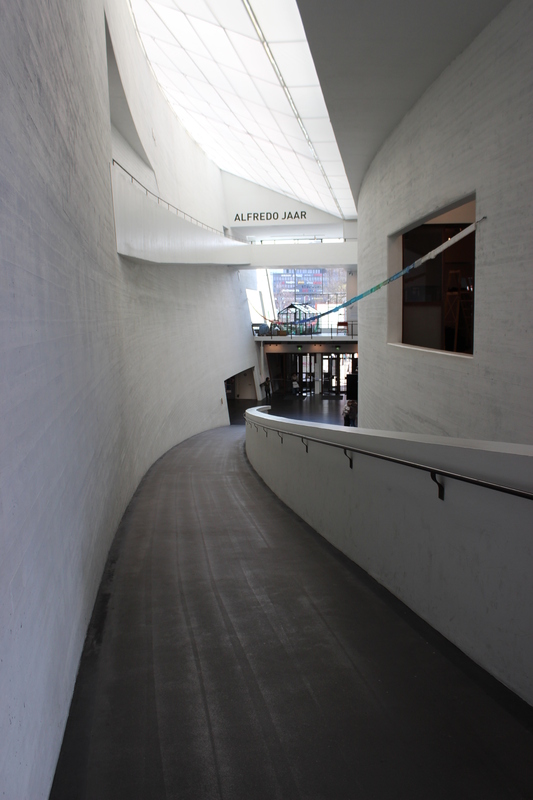 I visited some of the most important art museums of the Finnish capital: Ateneum Art Museum, Design Museum and Kiasma Museum of Contemporary Art. This may sound like a lot of museums to do in one trip, but in my opinion these museums provide interesting insight into what Finland used to be, how it has evolved, what it represents today and where it is heading to. In fact, I would even go as far as to say that what you will learn about Finland through art in these museums will lay foundations for your further encounters in Finland and make you better understand this sparsely populated but geographically big country, sometimes also described obscure. My first mission was to visit Ateneum and particularly its “Highlights of the Collections” section. To me this is where I would get to the roots of Finland; time travel to the Romantic Nationalism era of the late 19th century when Finnish artists begun to praise local traditions and culture. 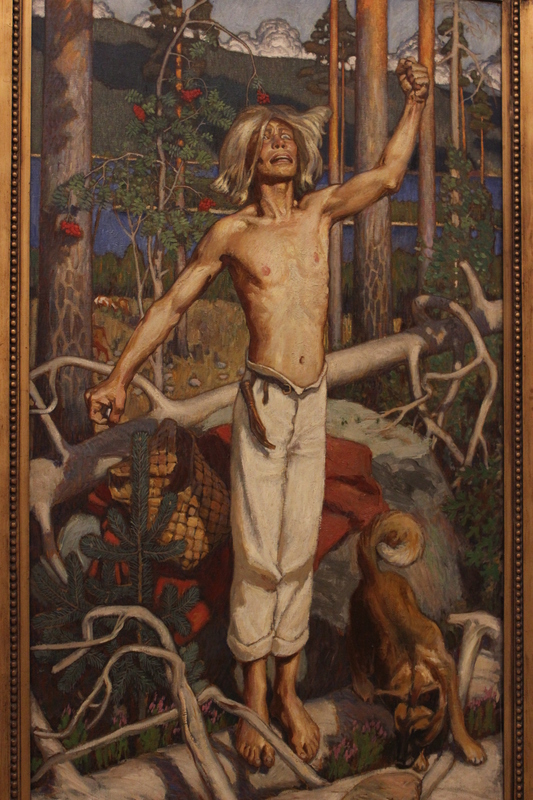 Kalevala (the national epic) and its mythology, lakes, majestic scenery, peasants, folklore and nationhood were recurring themes in the paintings of Akseli Gallen-Kallela, Eero Järnefelt, Albert Edelfelt, Helene Schjerfbeck, Hugo Simberg, to mention a few. As every Finn, I have seen these masterpieces thousands of times, but I wanted to revisit them to see what they can explain to me about my country of origin. As I continued observing, I was reminded of the harsh living conditions of this northern country, the period of the Swedish and then Russian rule, as well as of the solitary personality type of a Finn who still often is more relaxed alone (or in the nature) than with other people. Wandering in front of some of the most famous Finnish paintings did open the door to the Finnish soul and I understood that what these artists expressed more than 100 years ago is still very much alive. Today, the Finns continue to love the nature and lakes, and forest is a place of meditation. Indeed, this is why in Finland there are about 500,000 summer houses, sacred places where Finns jump into their dear lake in all weathers, often naked as in this painting. 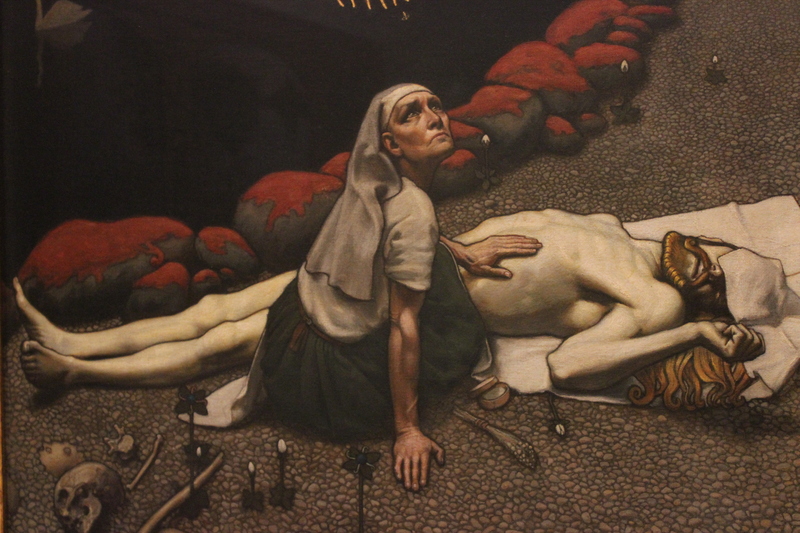 On my way out of Ateneum my mind was stuck on Finland that was an agrarian state much longer than its neighbors. How did this country that was so poor just over 100 years ago became one of the richest and most gender-equal nations of the 21th century? The answer to this question was to be found in my next destination, Design Museum, where I was going to witness the transformation that Finland underwent. First around its independence in 1917 and second immediately after the Second World War that left the country ruined and badly injured physically and psychologically. Already during the Russian rule Finland had taken steps toward showing its distinctiveness. The artistic triumph of the Romantic Nationalism era culminated in the Paris World’s Fair in 1900 when Finland made its international breakthrough: “we are culturally different from Russia” was what Finland was saying to the world and the world loved the message. When Finland gained its independence seventeen years later, architecture and design played an important role in the identity making. The poor, agrarian past remained in the back of the mind of designers, encouraging them to create simple and practical but aesthetic objects, often in harmony with the nature and natural materials. The predominant Protestant religion further directed the designers toward plain and unornamented creations. The years following the Second World War filled Finnish homes with tears and poverty, but some comfort was brought to the Finns by the international success of Finnish design. The postwar period in Finland is called the Golden Age of Finnish Design and for a good reason. This is when Artek, Arabia and Marimekko became internationally sough-after brands. The Aalto vase, created in 1936, continued to travel around the world, and Jackie Kennedy stood by her husband wearing a Marimekko dress in 1960. The Finns were slowly but surely recovering from the wounds of the war. 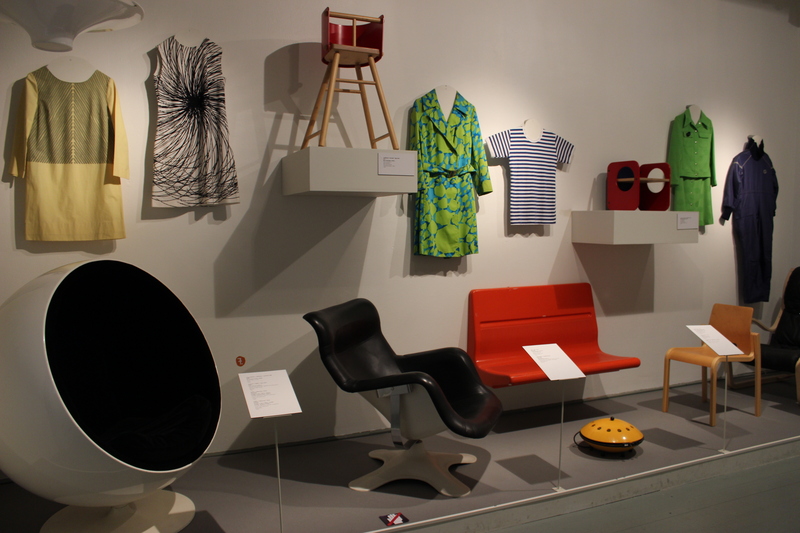 Finnish design continued to strengthen its domestic and international position in the ’60s, ’70s and ’80s. New materials like plastic emerged, creating new opportunities for designers like Eero Aarnio and Yrjö Kukkapuro who became forerunners of plastic chair design. As Finland grew richer, design expanded to home appliances (for example, Fiskars scissors) and various aspects of daily life (for example, Helsinki got its funky orange metro in 1982). 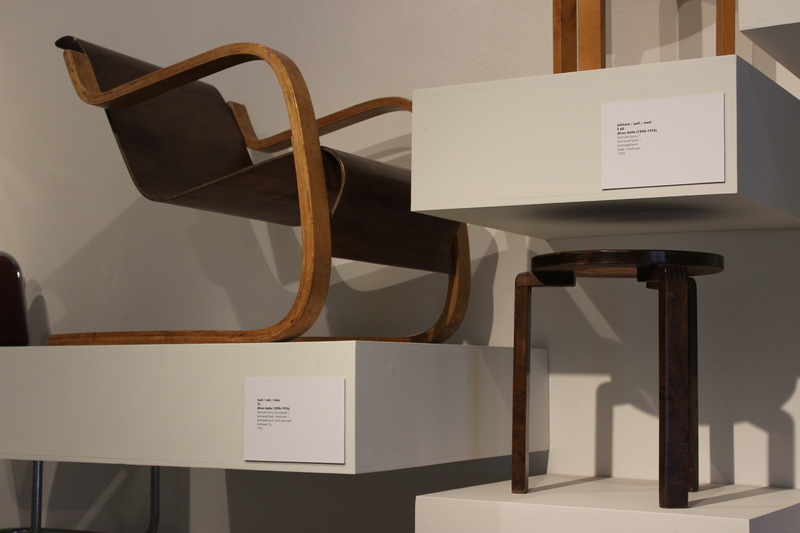 Indeed, during many decades Finnish design and art were seen as means to serve everyday needs, and everyday needs were seen as opportunities to create design and art. Convenient! Very Finnish! The moment I understood this idea, I understood a lot about Finland. Art and design were always meant to be available for everyone, regardless of person’s social class. The fact that every Finnish home is full of “design objects” is probably one of the best proofs of successful nation building that is equal and democratic…? Now, let’s fast forward to the ’90s. Once again Finland took big international steps and Finnish design contributed to the success of the world’s most famous telephone, the Nokia phone. However, this was not all that was happening. During the ’90s Finland embraced the world in an unseen way. Finland’s EU negotiations coincided with the construction of Finland’s first truly international museum, Kiasma. 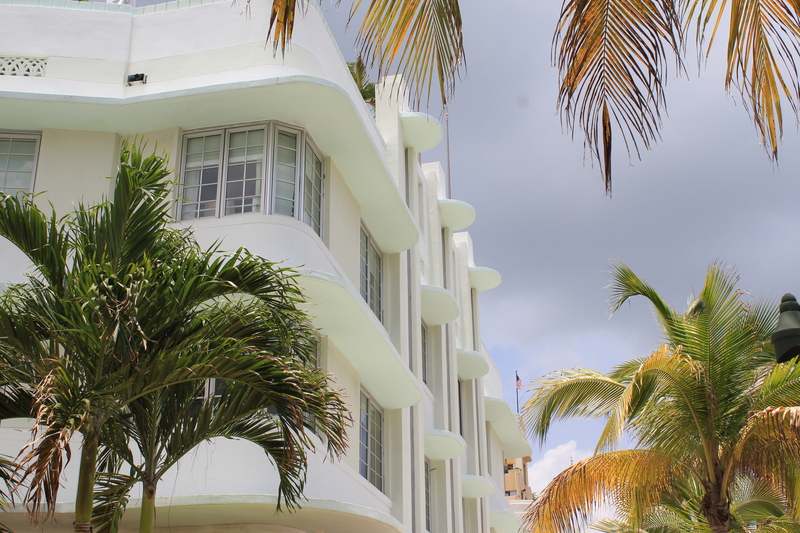 Curiously, but as a reflection of the spirit of the time, it was designed by an American architect. Some have compared Kiasma to Espace Louis Vuitton and Pompidou Center, but during my visit I realized that there was something particularly Finnish about Kiasma’s approach to contemporary art. Its desire to create a dialogue. In fact Kiasma is a platform where a dialogue between decision makers, artists, audience and society takes place, and as a demonstration of its ideology, I stumbled upon an exhibition curated by Finnish daycare children. Talking about participation and engagement! While I admired Steven Holl‘s minimalist hence oh-so-Finnish architecture, I realized that Kiasma played and still plays a very symbolic role: it is a prime example of Finland’s forward-looking attitude. Finland has strongly tied its development to the future (as opposed to some countries that are more past-focused) and is open to the world. As Ville Kylätasku, an aspiring, young Finnish artist residing in Berlin told me, “To me, Kiasma is like a window through which Finland looks at the outside world”. So, what did visiting these museums teach me about Finland? That art has played a strong role in the Finnish identity making. That art is practical and accessible. That often design objects and daily needs look the same. That Finland is a young country still looking for its place. That even after Nokia Finland will continue making international headlines. That there is nothing more sacred than a lake (and if you a foreigner visiting Finland, do jump –preferably naked– into that lake!). Note: The idea behind this write-up was to see what kind of Finland-related emotions and ideas these three museums bring to me –“me” being someone who left Finland in the ’90s, travelled the world and settled (at least for the time being) in Paris. “Me” being someone who finds herself no longer fully Finnish and not yet (and maybe never?) French, but who is interested in individual and national identities. Do notice also that I am not an art historian. I have tried to check facts and figures, but as always, do your own research and certainly do not take every word and sentence I wrote as a representative of the absolute truth. These are my ideas and should be taken only as such. Lastly, I would love to hear your opinion about Finland and Finnish art! Please do so by writing your comment below this post, by Facebook (Pearlspotting) or by Twitter (@Miia_Niskanen)! This entry was posted in Uncategorized and tagged architecture, art, design & decoration, fashion, Finland, Helsinki, museum, protestantism, religion, summer house on June 3, 2014 by Miia. Even during a rainy week there is something joyful happening in Paris. PS Why not to follow Pearlspotting on Facebook (Pearlspotting) or Twitter (@Miia_Niskanen)? This entry was posted in Uncategorized and tagged architecture, design & decoration, fashion, France, Paris on May 23, 2014 by Miia.